Never Enough Nails: Lynnderella Friday, Vol. 26! Whew, we're almost done with that wretched first week back to work after the holidays! I hate this week. I actually am not fond of the whole month of January either, but I guess I'll live! I did have some sparkly pretties to help me survive this week, including the new Lynnderella Hollo from the Other Side (LOL the name cracks me up, I have to sing it every time!). Hollo from the Other Side has these awesome new dot patterned silver holo circle glitters-you can see what I mean in the macro below. The circles have a bubble pattern right on them! 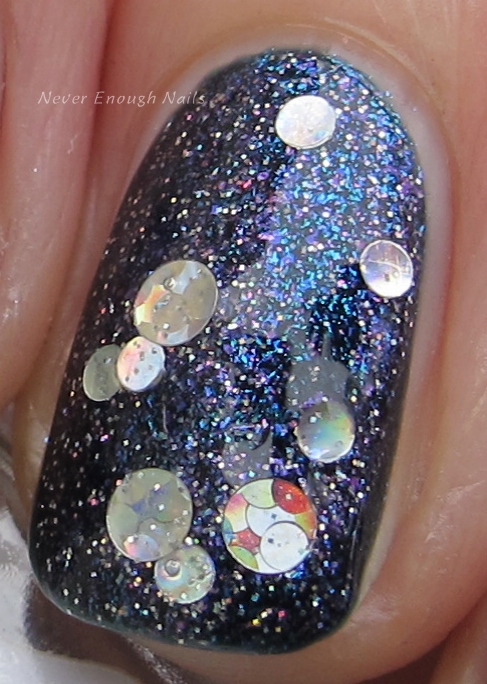 This also has regular silver holo dots and gorgeous pink, lilac and blue shimmer in a clear base. This is one coat over China Glaze Don't Get Elfed Up. The dark background really shows off the shimmer in Hollo from the Other Side! Hollo was easy to apply, it had tons of that shimmer and all of the dots came out on to the nails quite readily. Lynnderella Coeur a la Creme is an LE Valentine's Day polish that actually came out last year I believe. Luckily, there are some bottles left for this year! 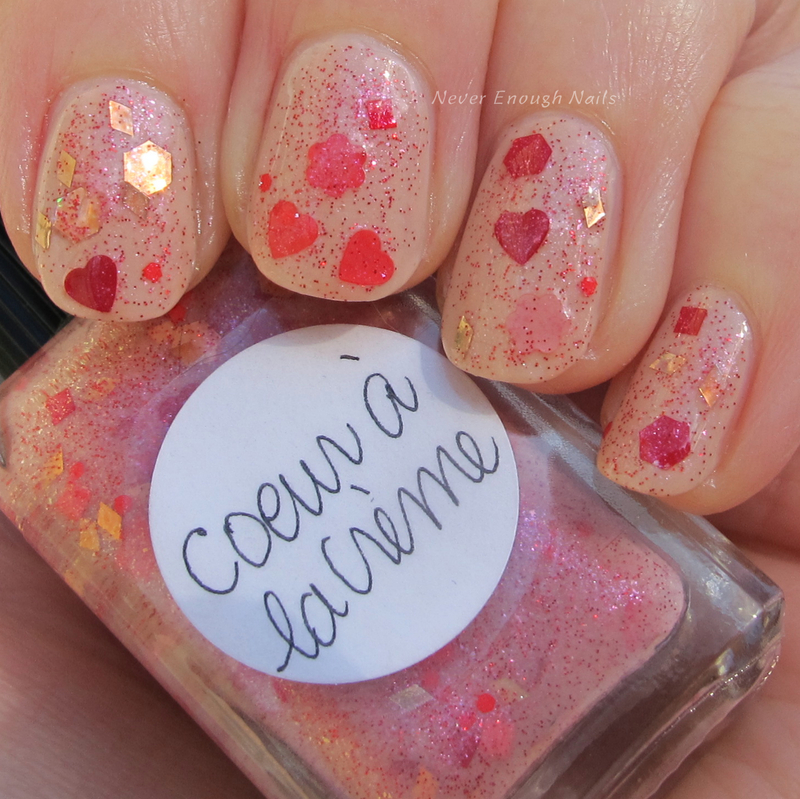 Coeur a la Creme has a sheer pale pink base filled with red microglitter. It contains red, pink and gold larger glitter accents in various shapes, including hearts (of course), holographic diamonds, large hexagons, and flowers! 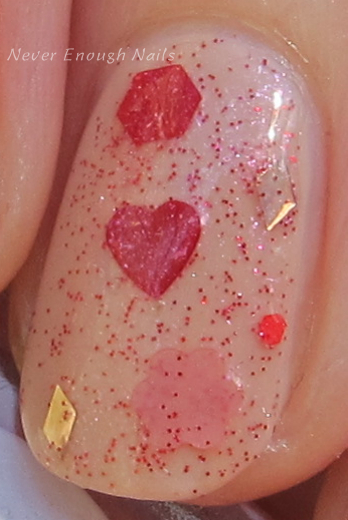 This is one coat of Coeur a la Creme over three coats of Zoya April (swatches coming soon!). Coeur a la Creme was pretty easy to apply with the dabbing method. I did push some of the glitters into their places for a neater, more spread out appearance. Typically, I don't do a lot of Valentine's manis, but this put me in the mood to start them early! !